"In the night of 21 to 22 May, the Russians had erected a very important gabionade 60 metres from the wall of the cemetery, in front of our Attacks on the Left. General Pelissier, who was by then Commander in Chief of the Army of the East, was resolved to capture these works to get rid of this dangerous work. Three columns of attack were organised for this operation. The Right-hand Column under the orders of General de La Motterouge was formed from the elite companies of the 1st Regiment of the Foreign Legion, supported by battalions of the 28th and 18th Regiments of the Line. They had, for the reserve, the greater part of the 1st Regiment of the Voltigeurs of the Guard. This column debouched on the south-east corner of the cemetery to attack the Russians lodged on the slope of the ridge which dominated everything from the north. The Left-hand Column, commanded by General Renard, comprised three companies from the 10th Battalion of Chasseurs a Pied, the 2nd Regiment of Foreign Legion and a battalion of the 98th Regiment of the Line. They were to advance via the Quarantine Bay to attack a group of Russian Ambuscades which supported the work. This column is supported by the 1st Regiment of Voltigeurs of the Guard and a part of the 2nd Regiment [of Voltigeurs]. A third column, commanded by General Pate, is composed of two battalions from the 2nd Regiment of Voltigeurs of the Guard under the orders of Colonel Marolles, the 5th Battalion of Chasseurs a Pied and the 80th Regiment of the Line, which, in case of failure of the other two, were to attack the work in front. This principal reserve is held in the second parrallel, behind the cemetery, to remain there until disposed by General la Salles. 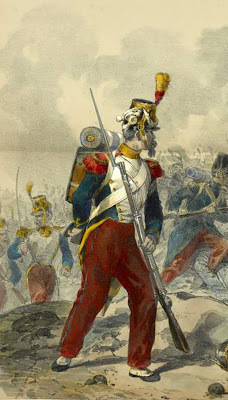 The General Laboeuf, accompanied by Lieutenant-Colonel Verniet de Laumiere, newly promoted, and Captain De La Jaille, all from the Artillery of the Guard, was the officer close to the person of General Pate who was commanding the reserve. As the night fell, all our troops were prepared, all waiting for the signal, which would be given at nine o'clock in the evening. Our Column of Attack on the Left is launched with resolution; they cleared the ambuscades crowning the escarpment which bordered the right bank of the Quarantine Ravine. After an obstinate combat, they remained masters of the position. On the Right, the column of General de La Motterouge first siezes the gabionade. The Russians return in great number, and the companies of the Foreign Legion are ejected, onto the 28th Regiment of Line. These recover and soon go back to the combat. But a fresh Russian regiment makes a new offensive, at around half past ten, forces our troops to retire again. One battalion of the 18th Line stopped the enemy with its violent fire and forced it to retire in its turn. Two companies of the 1st Battalion of the 1st Regiment of Voltigeurs of the Guard are also sent, to the extremity of the cemetery, on the side of the Quarantine, to defend against an approach by the Russians to outflank our troops where they were able to establish ambuscades after a fierce combat. The two companies of Voltigeurs, stand on guard and survey the two ambuscades. This produced a moment of calm in the combat, whilst French and Russians re-assembled their forces. The two companies of the 1st Voltigeurs detached at the cemetery resist heroically against all the most furious assaults. The officers fall one after another. The Captain Devoge has his arm broken by a gun-shot; the Lieutenant Niel and Sous-Lieutenant Fariau are wounded. But not a man retires. The only remaining officer, the Sous-Lieutenant de Sommyevres, is remarkable for his sang-froid and his courage through the whole ordeal. His clothes are ragged wtih holes from musket balls and bayonet thrusts; finally he too is wounded. The neighbouring company is commanded by the Sergent Jeantrelle: a veteran Sub-Officer who has taken command of his company because all the officers are dead. At a return offensive by the enemy, he shows the example and is the first our men to attack them. He fights body-to-body with the Russians, and kills three with his own hand, but he stumbles and falls over on the ground and is carried off to the ambuscade. His sang-froid never left him, and in the blink of an eye, he turns from his agressors, and rejoins his company. The Sergent Casanova spent the entire night on the battlefield to carry orders from the Lieutenant-Colonel Mongin to the two [detached] companies. With the aid of two elite companies from the 2nd Foreign Legion, the Voltigeurs push the Russians into the ravine. The General de La Motterouge, calls on the battalions of De Boulatigny and D'Anthes of the 1st Regiment of Voltigeurs. It is about one o'clock in the morning and we have been fighting since nine in the evening. Our troops are overwhelmed. 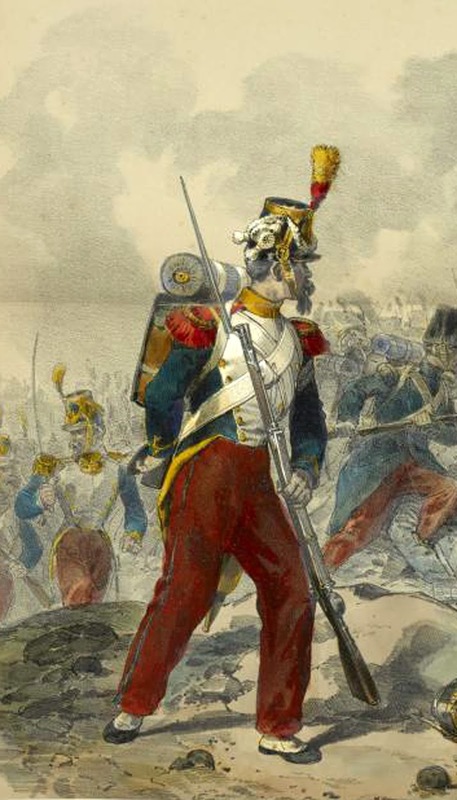 It is now that the troops of the General Reserve are called forward: it's the 1st Regiment of Voltigeurs, commanded by their Battalion Chiefs Farine and Gremion, who receive the order to go forward to retake the gabionade that our troops had been driven out of. to attack the Russians withthe bayonet and tumble them into the ravine. The brave Anthes inspired his men by his example, they went at the run and starts with impetuosity on the Russians, who, turned over, were pursued the bayonet in the belly, withdrew in disorder into the same city walls. But the Commander Anthes has fallen seriously wounded, both legs shattered by a bullet, a terrible injury that cost him his life."